This project involved the development of a new retail center on South Commercial containing an 18,000 sf, two-story, retail building which was designed to accommodate two drive-up tenants at each end of the building. 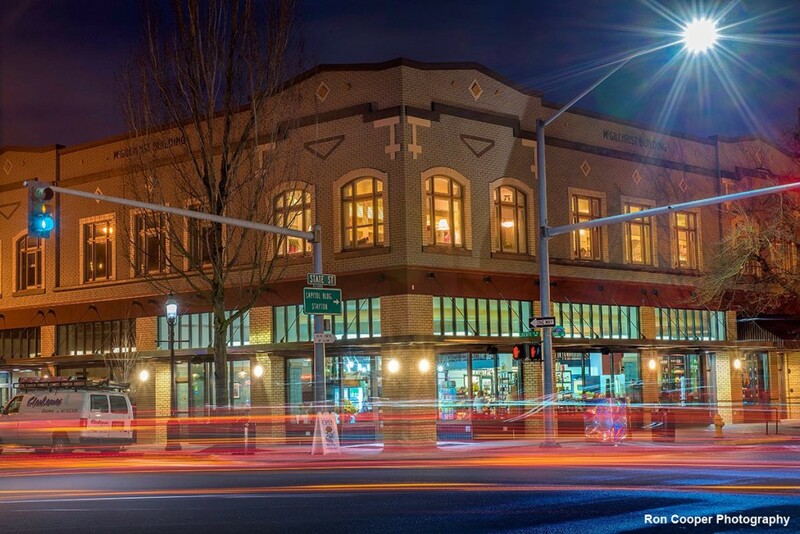 The building has a northwest design vernacular coupled with a town-center appeal. 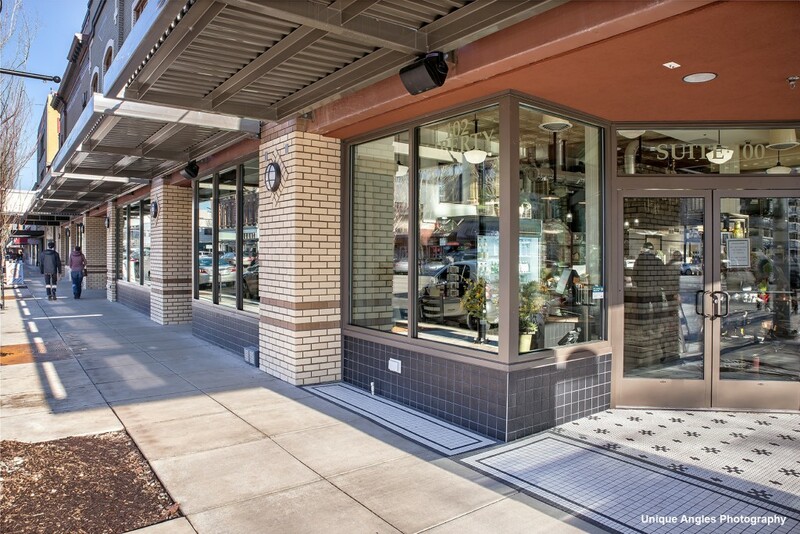 The development also included the addition of French Press Coffee & Crepes on the southeast corner of the property. Hollywood Station Office is part of a complex of Urban Renewal projects in the Hollywood District that includes the new senior center and a rowhouse development. 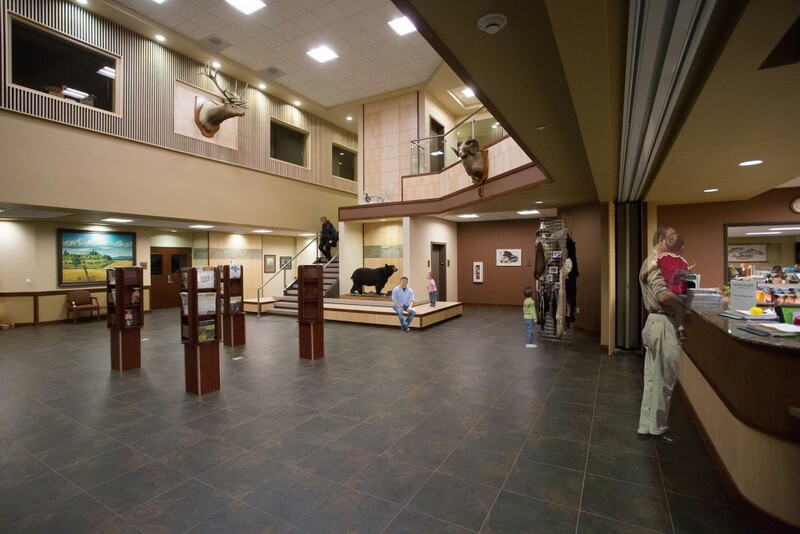 The building has approximately 12,000 square feet per floor. The first floor is intended for retail while the second floor is intended as office space. 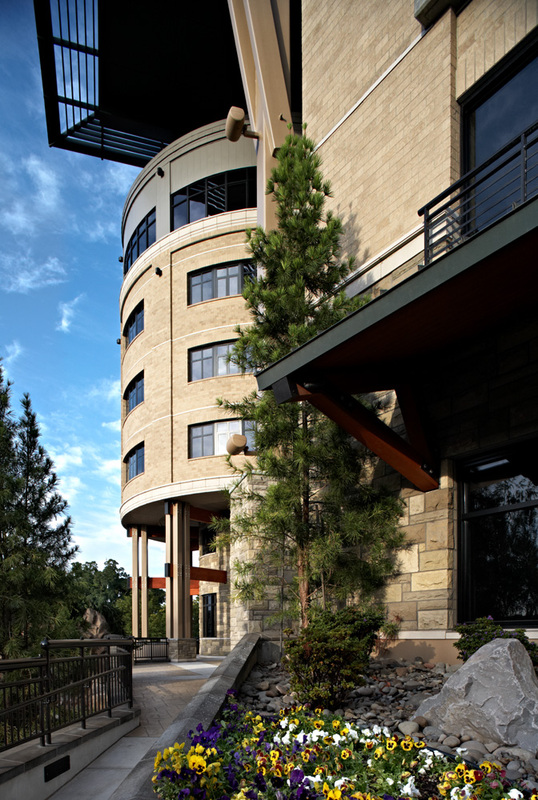 The exterior is concrete block consisting of blended split face block with horizontal smooth face block accent bands. 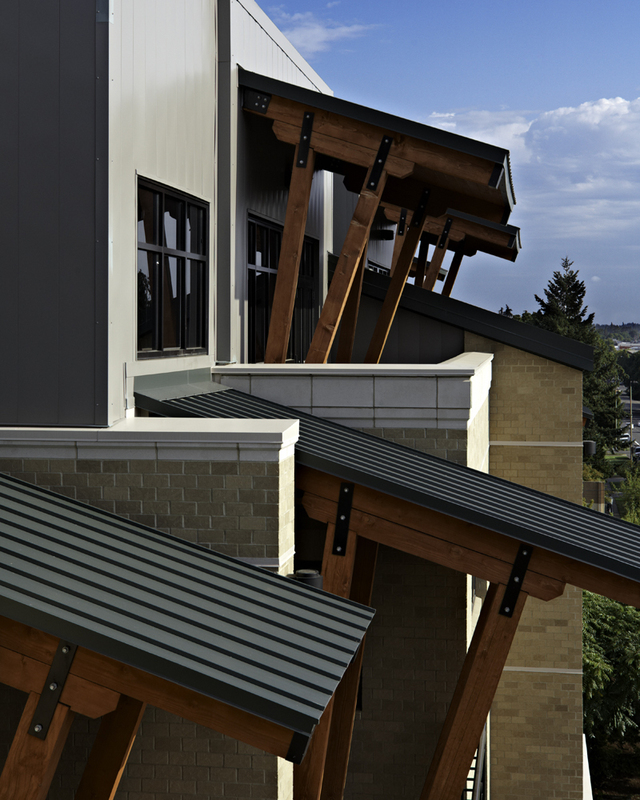 The window frames are mill finish aluminum and have aluminum colored canopies to protect the first floor entrance points. The historic adaptive reuse and rehabilitation of the McGilchrist Roth Buildings has served to revitalize Salem’s downtown core. These two 1916 structures were stripped down to the original studs and conjoined to become one building. 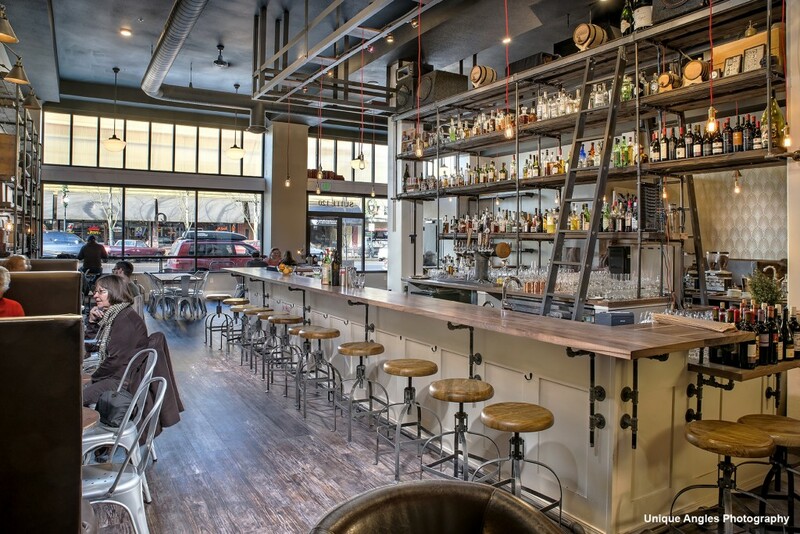 During demolition, a program of tenant spaces and occupant needs was developed. 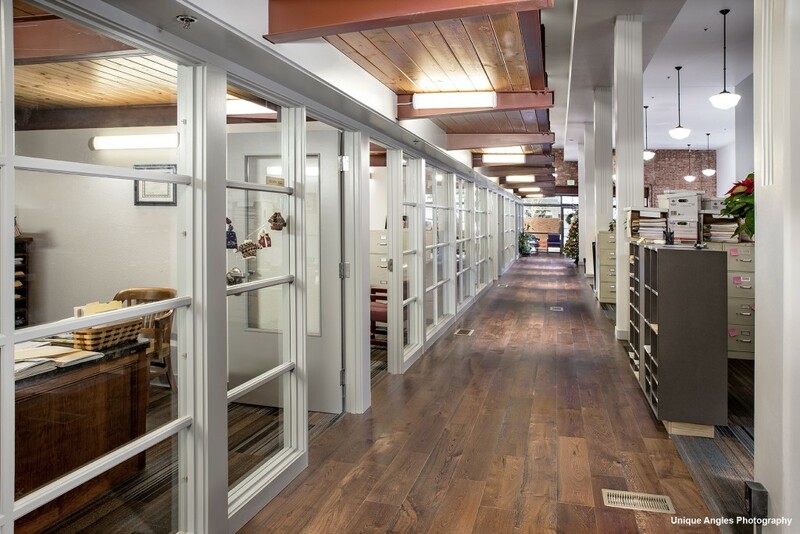 The McGilchrist and Roth buildings underwent major structural repairs and seismic upgrades, including concrete footings, shear walls, steel beams and columns, as well as hundreds of new floor joists. Approximately 3,500 board feet of lumber were salvaged from the two buildings. The wood was kiln dried and milled into 1x trim material to be used as interior ornament. The building now includes nine second-story apartments of various size and layout. All apartments feature exposed brick walls and highlight the historic intricacies of the building’s past use. 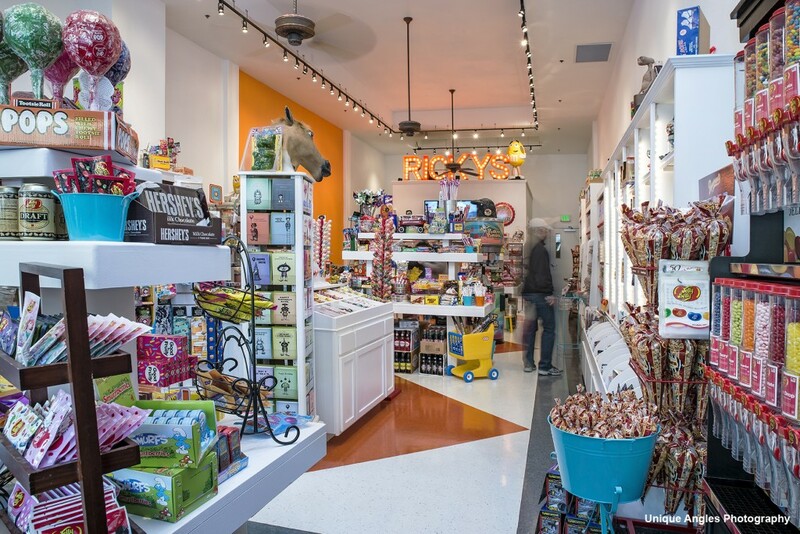 The first floor includes five new businesses, including Gayle’s Italian Market, Archive Coffee and Bar, Ricky’s Bubbles and Sweets, Doty, Pruett, Wilson, PC, CPA firm, and Diversified Financial Benefits. 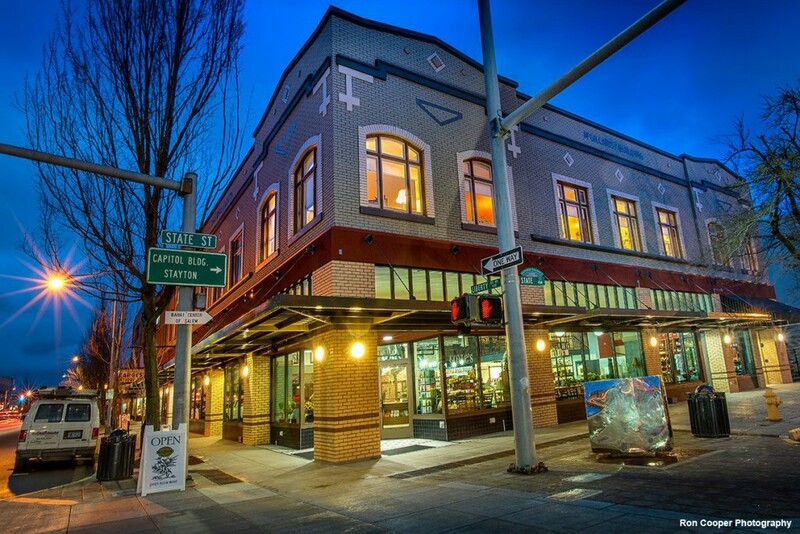 Each business exhibits its own distinct look while embracing the historic nature of the building. As noted by Sheri Wahrgren, Salem’s Downtown Revitalization Manager, a significant rehabilitation like this will increase the property values of all downtown buildings and serve to reinvigorate Salem’s commercial core. One of our newest projects involving mixed use development, this 6-story (plus two basement levels), 190,000 s.f building was built to house Class A office space and 89 luxury condo suites. 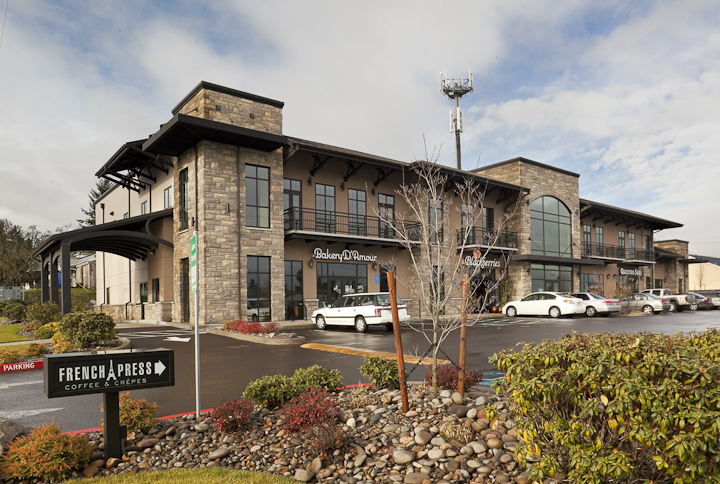 The downtown location was picked for its close proximity to Salem Hospital, the new Salem Conference Center and for its view of the Willamette River. Ample parking, both covered and uncovered, is available for this facility, which is a rarity for structures in downtown Salem. Mission Oaks is a two story 27,200 s.f. office building with brick veneer exterior. The visible portion of the roof is concrete tile and curved copper. The first floor, in addition to an entry lobby, has four potential lease spaces, two of which have had the tenant improvements completed. The entire 13,700 s.f. second floor houses Professional Mortgage Corp. and includes a deli to serve the entire building and outside customers as well. 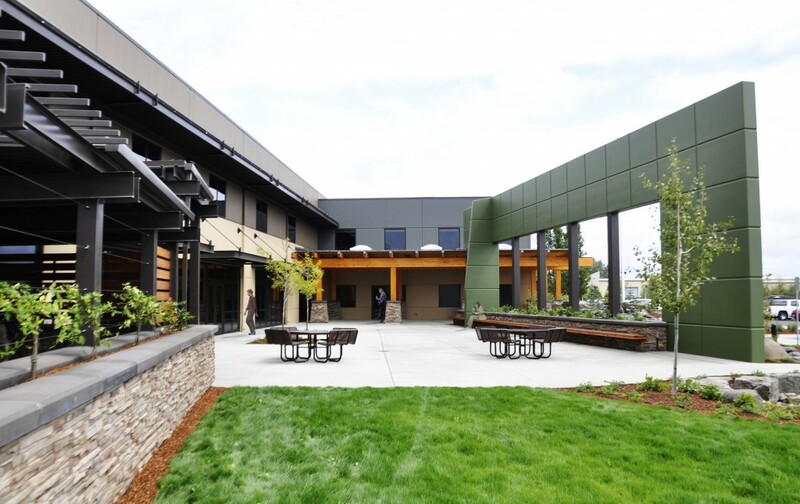 The parking area has been screened from the street with a masonry wall and landscape berm which, in addition to the masonry entry piers, brings a sense of place to the facility. 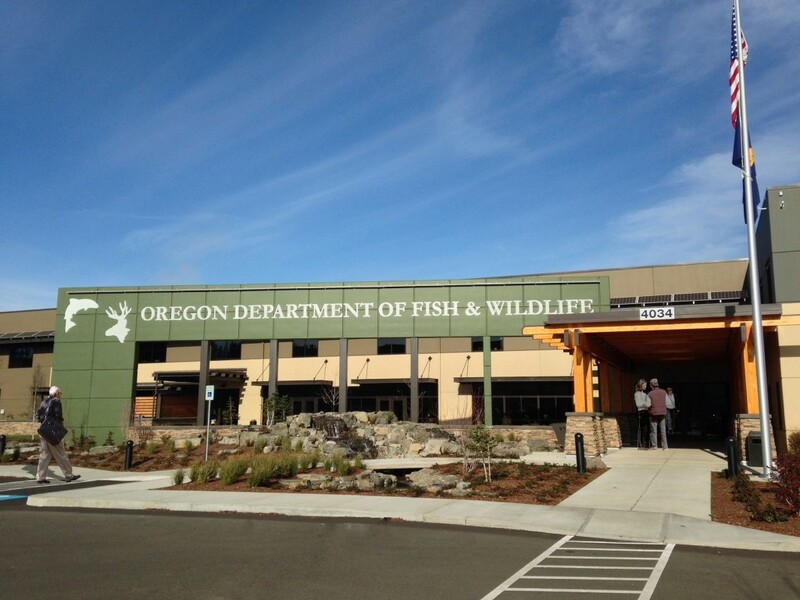 The State of Oregon’s new headquarters building provides office space for all seven divisions within the Oregon Department of Fish and Wildlife (ODFW). 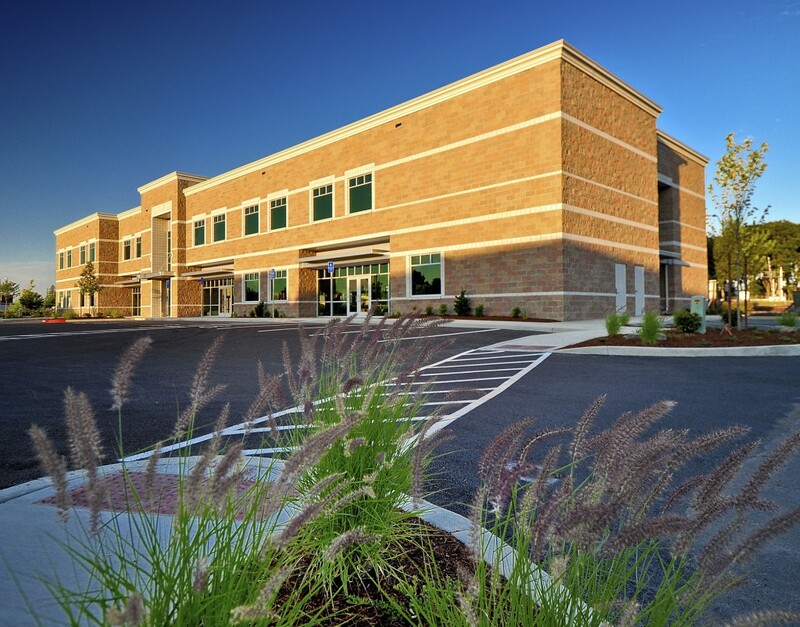 As a successful example of large-scale adaptive re-use, the project incorporates new design features that include exterior improvements, an extensive interior remodel, and a second floor addition to a former distribution warehouse and office building. The completed 110,000 s.f. headquarters provides a 3,000 s.f. Commission Room, classroom/training space, display areas, conference rooms, secure storage, computer/IT spaces, and open office system furniture areas. 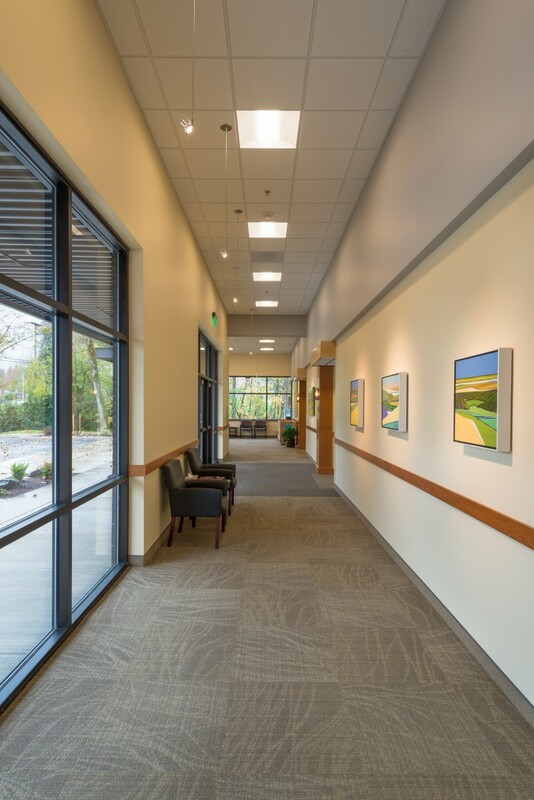 In order to bring large quantities of daylight into the 50,000 square-foot floor area, new windows were cut into the exterior walls, skylights added to the roof, and open office system furniture positioned to allow perimeter daylight deeper into the building. 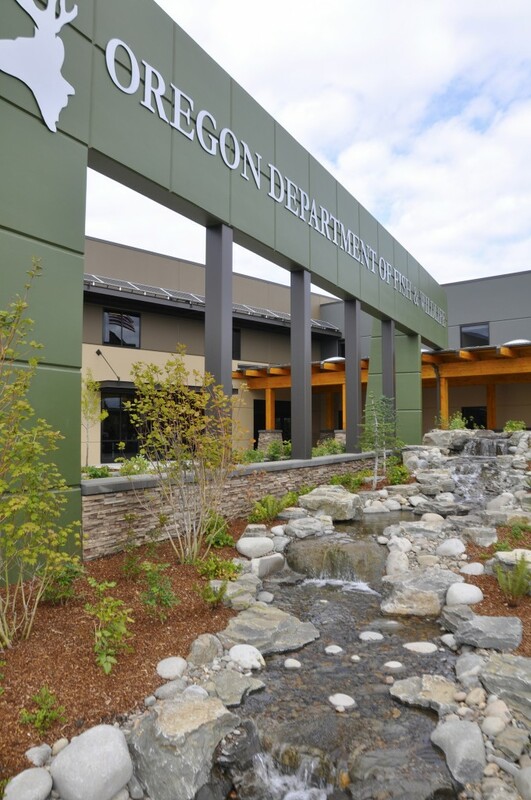 Site improvements include large outdoor spaces for department functions, parking lot expansion, loading dock revisions, landscaping with native materials, and an upgraded entry sequence. 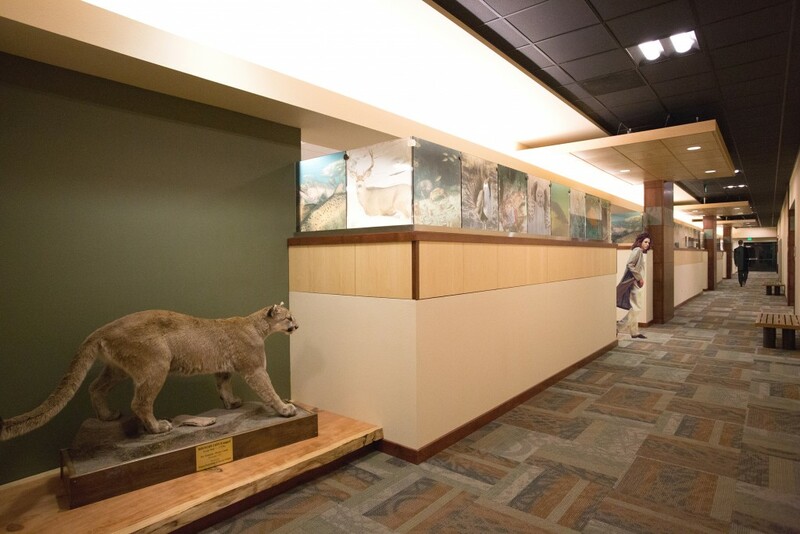 Earth-tone materials and specimens of Oregon wildlife exhibited throughout the building provide an attractive and inspiring environment for ODFW staff and visitors alike. 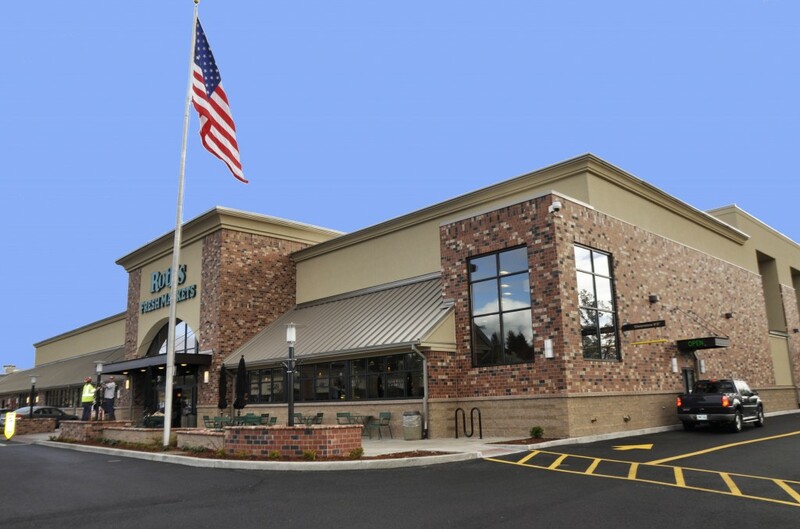 The project encompassed a 10,000 sf addition to the south side of the store. The existing building, approximately 45,000 sf, was renovated mostly in it’s entirely. 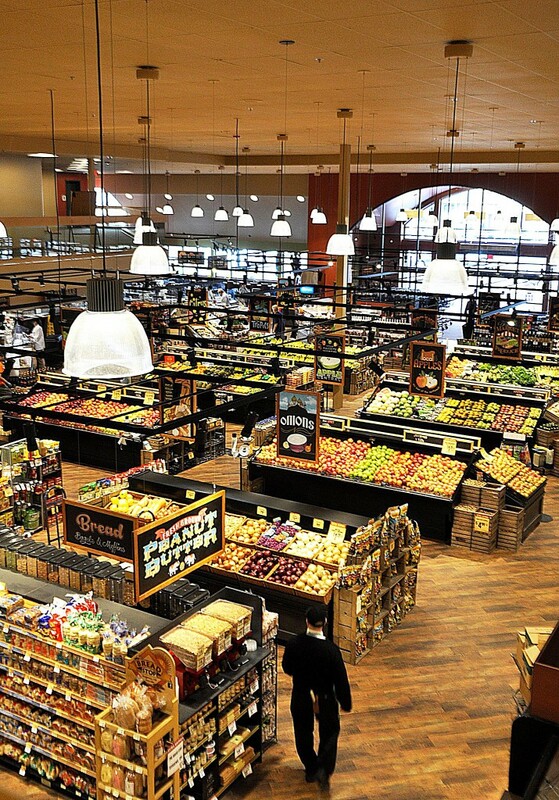 The existing grocery store was renovated to include relocated as well as new department locations, finishes, entry vestibule, and a newly added catering kitchen. 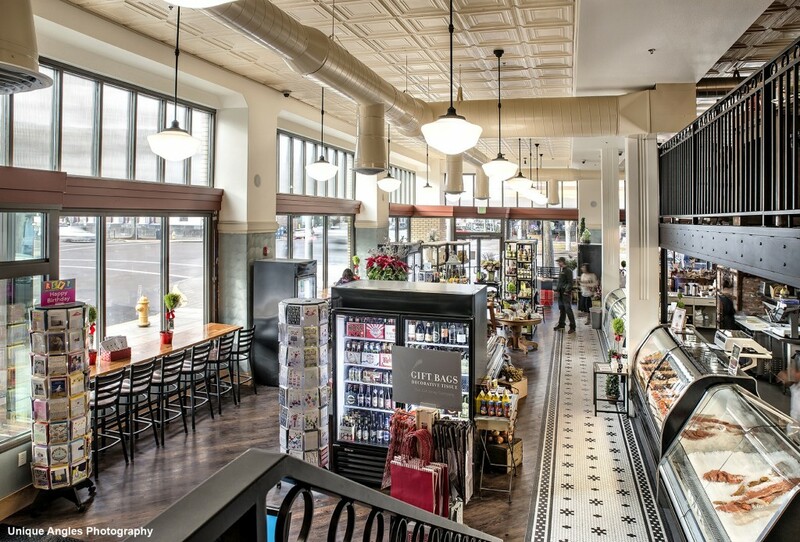 The building addition served a first floor deli and bakery department use as well as created a new state of the art meeting room with a capacity of 250+ people on the second floor of the addition. The meeting room divides into three separate rooms with the use of operable partitions to serve multiple purposes. Each room has state of the art projection screens and audio/visual equipment. New restroom facilities were provided for the renovated meeting rooms spaces. A new meeting room/food demonstration kitchen was also created along with a 2nd floor catering kitchen to serve the meeting rooms. 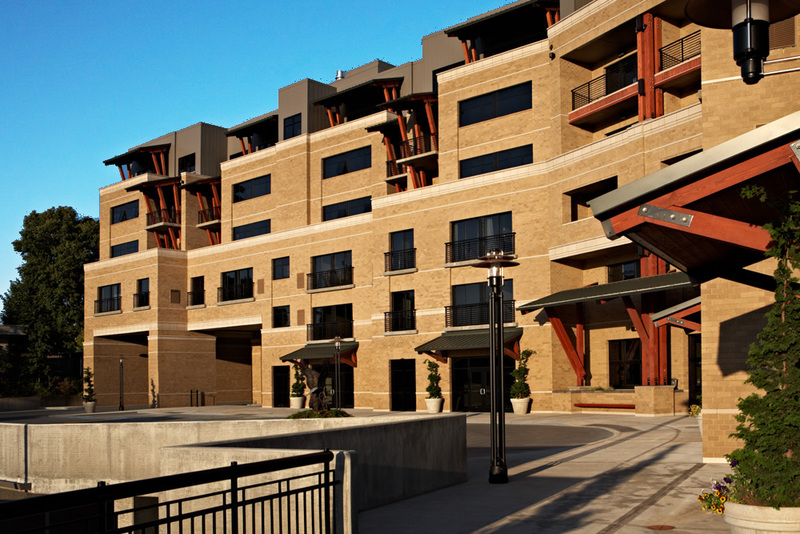 Exterior renovation included a new plaza, roof, and an upgraded hospitality entrance. 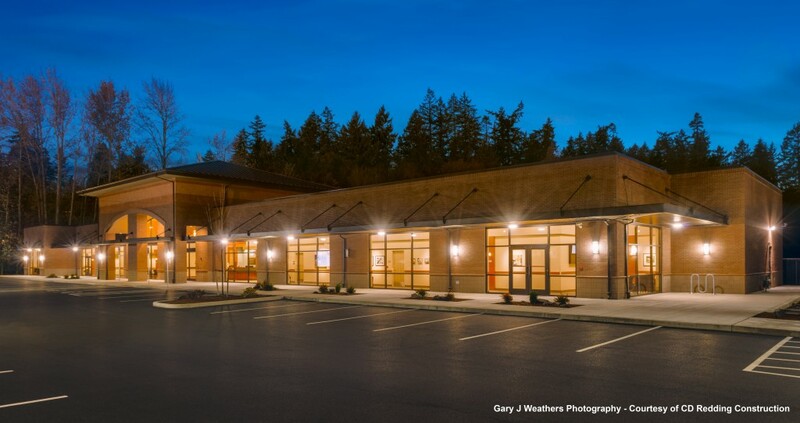 Santiam Memorial Hospital replaced their previous clinics in Mill City and Sublimity to better serve their patients. 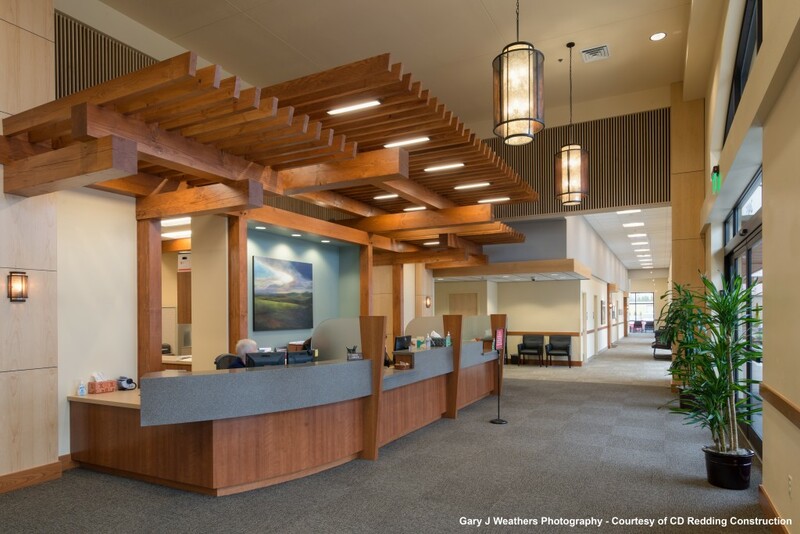 Their new 3,700 sf and 4,660 sf buildings provide more room for their growing patient list while making circulation patterns and spaces much more efficient for the staff. The exterior is stone veneer and shingles with gabled roof line to fit in with the buildings in this rural area. 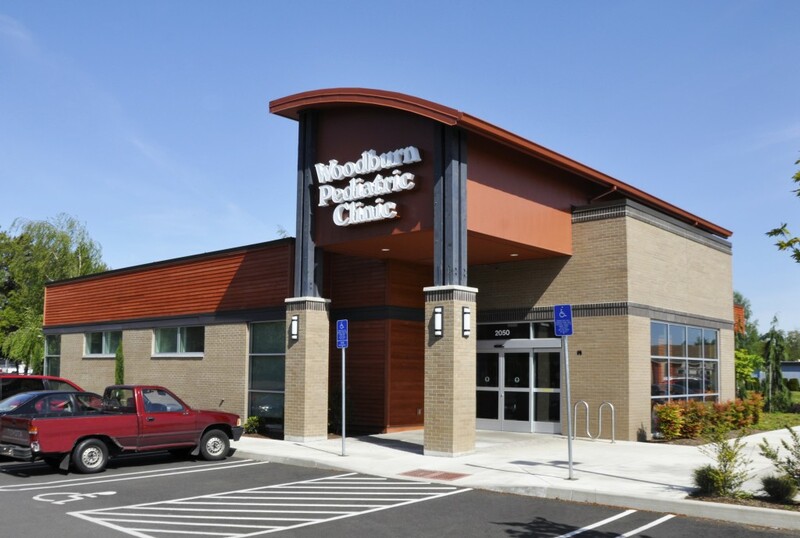 Woodburn Pediatric Clinic is a single story new 6,804 square foot pediatric clinic with a 1,718 square foot expansion planned for future use. The exterior is a combination of brick, wood, lap siding, metal and glass. 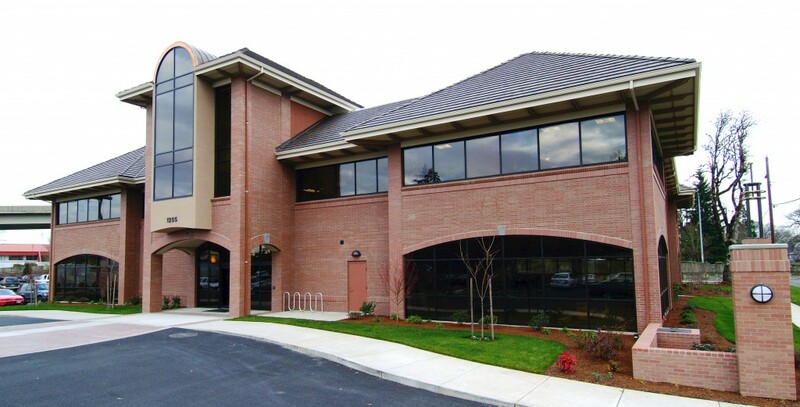 The clinic was programmed for 9 healthcare providers and is located in Woodburn, Oregon. 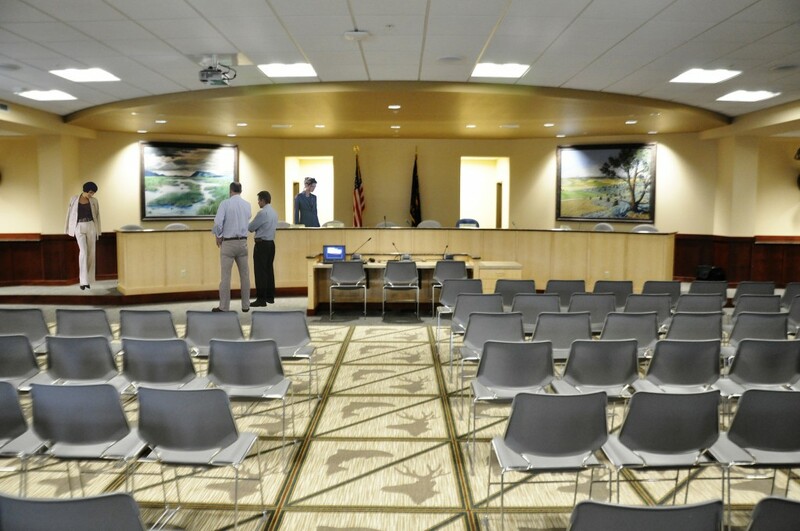 A type III Design Review and a type III phasing plan application was required by the City of Woodburn for the facility. 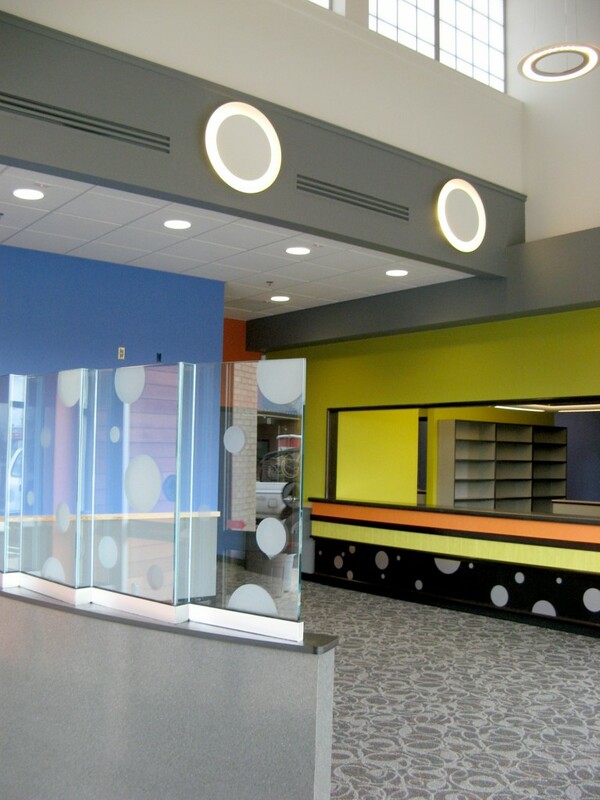 Daylighting with a large central skylight is an architectural highlight as well as a brightly colored and vibrant interior materials package geared toward making the children comfortable in the facility. 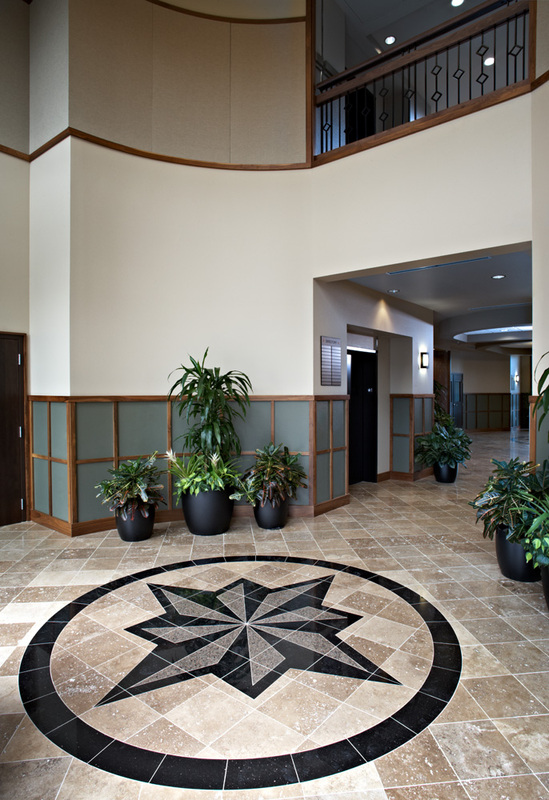 A circular interior theme is repeated throughout the clinic in the walls, lighting, floor patterns and glass. 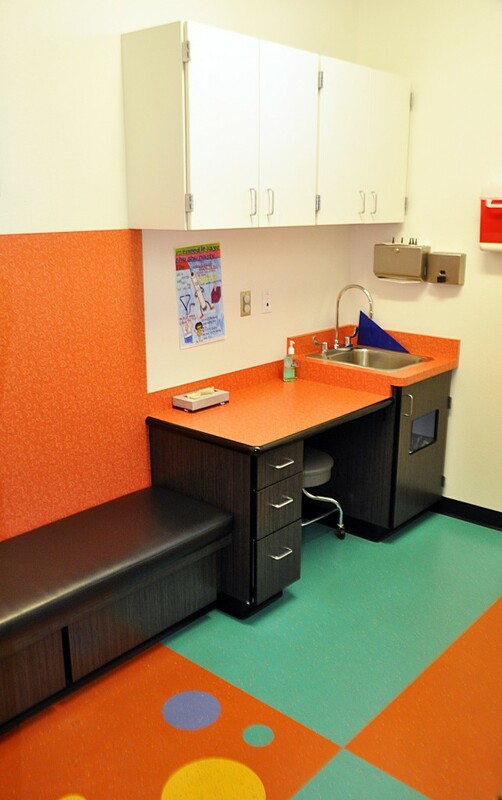 Spaces such as exam rooms, offices, lab space, treatment rooms, storage, filing, break and waiting rooms are all space planned to utilize the space in the most efficient manner. 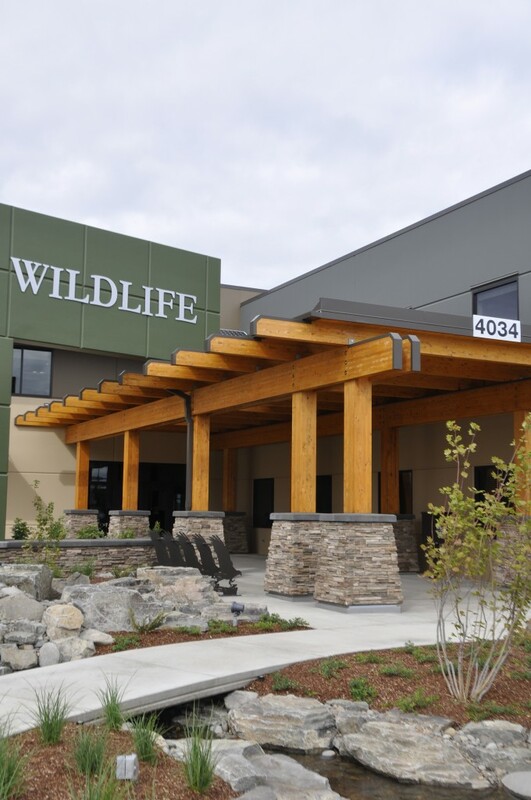 WVP Medical Group at Boulder Creek North is a 14,300 square foot medical clinic consisting of exam rooms, minor surgery procedure rooms, vitals alcoves, and a lab/draw room. The clinic support areas consist of soiled holding rooms, clean supply rooms, and a medical waste collection room. There are four Provider offices and nurse’s work stations for the separate staffs. 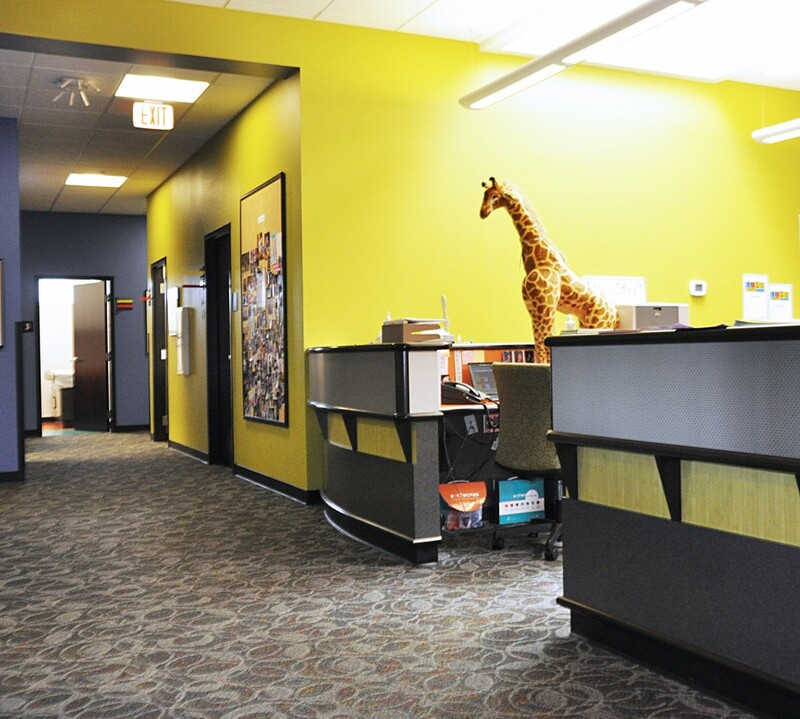 Administration facilities include an administrator’s office, supervisor’s offices, clerical staff work stations, a large patient check-in / check-out area, conference and education rooms, and staff lounge area. The entire facility is set up with access controls at all patient corridors and private staff areas. 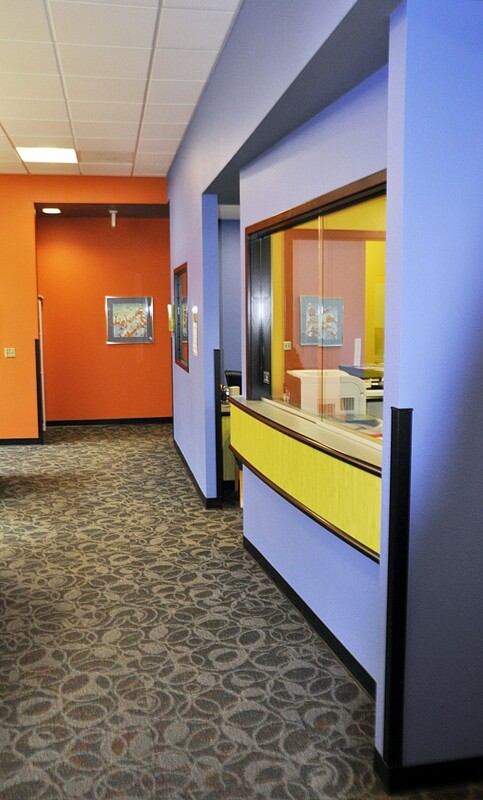 The clinic was built to meet HIPAA security standards.